There are various types of Bengal - there are two patterns, and several colours - but ultimately every Bengal should be the same shape. This page explains the patterns and colours, describes the shape required for a ‘good’ Bengal. 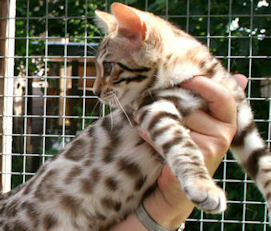 The spotted bengal may have plain spots or rosettes, though for showing and breeding it is preferred that they have rosettes. Rosettes may be arrowhead shaped, doughnuts, half doughnuts or paw prints. The legs and tail are usually striped, but it is preferred that they have some spotting. A kitten may be born with rosettes, or they may develop later and are usually seen by 8 weeks of age. 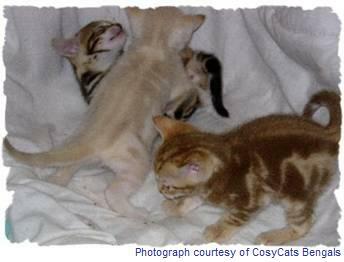 Kittens, around the age of four to six weeks, usually go through a period of ‘the fuzzies’. Their pattern usually clears by the time they are around six months old, though the fuzzies have been known to last longer. Whilst in the fuzzies, the pattern can become indistinct or ‘fuzzy’ looking, as in the photo on the left. This then clears as the kitten grows, and the spots become clear and sharply defined. 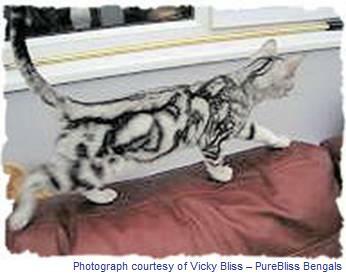 The marbled Bengal has swirls of colour. It is important that the flow of the marble pattern is mostly horizontal, and the ‘bulls-eye’ pattern on the side of the cat should be avoided. Marbles do not seem to suffer from ‘the fuzzies’ the way their spotted littermates do. However, when marbles are born, they usually only have the basic outline of the pattern they will eventually develop. It takes some time for a marble to display the beauty of it’s pattern, with all of it’s swirls of multiple colours. The Brown (Black) Bengal can come in various shades of brown from the darkest charcoal, through all shades of brown to a rich tan. The Bengals with the pale golden colours are often referred to as ‘golden’ Bengals, though officially they are still registered as brown. The background can be the palest cream or a rich tan or orange colour. The spots can be black or various shades of brown. Cats with ‘rufous’ (red/orange) tints are preferred, though this colour isn’t always apparent in kittens when they are very young, and often develops as the kittens get older. The most important thing is that the markings are very clearly defined, whatever the shade of brown. The eyes of the brown bengal should be brown, green or hazel, and the tip of the tail must be black. On young kittens the paw pads are often a dark brick red, but by the time they are adults, the paw pads should be black. The nose leather should always be brick red. The blue-eyed snow spotted Bengal is born white/ivory, though the marbles may have some pattern and colour when first born. The true colour and pattern develops as they grow older. 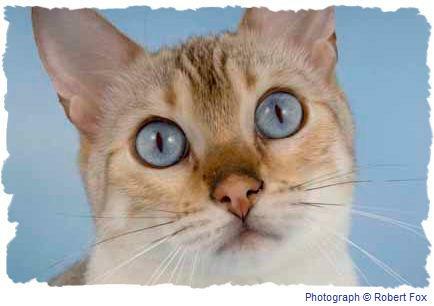 The blue-eyed snow Bengal should have a pale ivory background, with a pattern of spots or marbling in any shades of brown. The photo on the right shows some rufous colouring in the points - this is not a desirable trait. Although the points (head and feet) are usually quite visibly darker in kittens, as an adult there should be very little difference in the depth of colour between the body and the points. The eyes should be a clear blue - and the stronger colours of blue are preferred. The paw pads and nose leather on a snow should be a brick red and the tip of the tail must be black. The GCCF call this cat the Blue-Eyed Snow, and TICA call it a Seal Lynx Point. 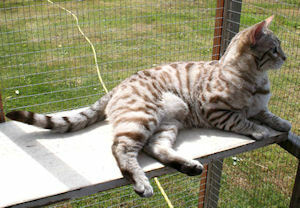 The GCCF call any snow Bengal that doesn’t have blue eyes, an AOC snow (Any Other eye-Colour). However, genetically there are two types of AOC snow. TICA recognise the difference between the two types, and call them the Seal Mink and the Seal Sepia. The Seal Mink is genetically a mix of the Blue-eyed Snow (Seal Lynx Point) and the Seal Sepia (see Bengal Genetics) and has mid coloured markings (mink brown) with aqua eyes. The Seal Sepia is a snow with the same ivory background as the blue-eyed snow, but with much darker markings (sepia brown), and with eyes that are brown, green or hazel. The markings on the kittens are usually visible at birth. The Silver Bengal is a striking mix of black spots on the palest silver grey background. The eyes are often a pale green. When rosetted, the centre of each spot is a mid grey. The silver should not be ‘tarnished’ - that means that it should not show any signs of brown in the coat. The tip of the tail should be black. The background of the Blue Bengal should be off-white/ivory, or even with peachy undertones. The markings should be clearly defined blue. The tip of the tail should be dark grey. Blue Bengals do not qualify for championship status with either the GCCF or TICA. They can be shown under ‘new traits’ with TICA, and it is hoped that they will soon be promoted to full status so that they too can become Champions. 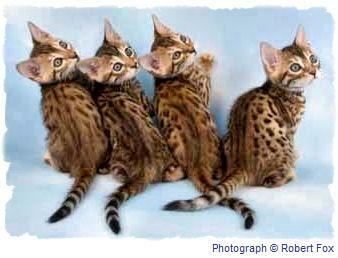 These cats are similar to the Brown (Black) Bengal, except that there is no black in the coat, only a dark brown on the chocolate or a mid brown on the cinnamon. The chocolate is also called the Sorrel and the cinnamon is also called the Tawny. The tip of the tail is always a chocolate or mid brown. These colours can be shown under ‘new traits’ at TICA shows, but do not qualify for championship status. The picture shows Cinnamon and cinnamon snow kittens. Now comes the fun! Because you can ‘mix’ some of the above colours together. You can have snow silvers, blue silvers, chocolate silvers or cinnamon silvers - but you might never know, unless you know the genetics of the cat, as these cats will always be silver coloured. Then there is chocolate snows and cinnamon snows. You can also have a blue snow, or a Lilac (chocolate+blue), or a Fawn (cinnamon + blue). And if you really want to get complicated, then mix all of the colours to gether to produce a blue silver snow! New colours can be shown under ‘new traits’ at TICA shows, but do not qualify for championship status. 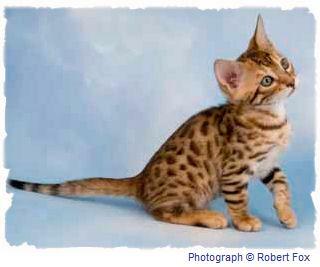 The ‘standard of points’ is used when judging a Bengal cat. Each governing body (e.g. GCCF, TICA) have their own own standard of points, though they are very similar. 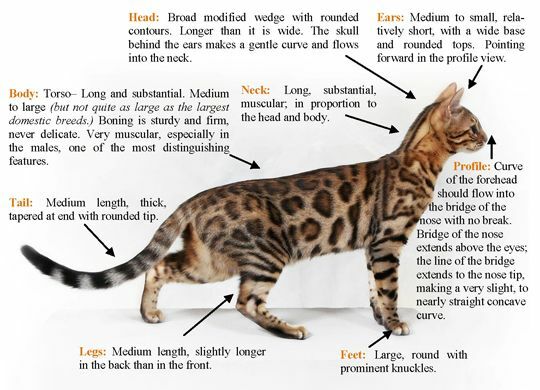 Here is a summary of what a Bengal cat should look like, taken from the GCCF and TICA standards of points. This is not the full standard of points, and should you wish to purchase a cat for showing, you should obtain a full copy of the standard of points from the governing body of the shows you wish to attend. The goal of the Bengal breeding program is to create a domestic cat which has physical features distinctive to the small forest-dwelling wildcats, and with the loving, dependable temperament of the domestic cat. A broad modified wedge with rounded contours, longer than it is wide. Slightly small in proportion to the body, but not to extremes. The skull behind the ears should gently curve and flow into the neck. Ears should be medium to small, relatively short, with a wide base and rounded tips. They should follow the contour of the face looking from the front, and point forward looking in profile. Eyes should be oval, almost round, large but not ‘bugged’. They should be set wide apart and have a slight slant towards the base of the ear. Eye colour is independent of coat colour, except for the blue-eyed snows, but the stronger the colour, the better. The chin should be strong and align with the tip of the nose in profile. The muzzle should be full and broad with prominent whisker pads and high pronounced cheekbones. There should be a slight muzzle break at the whisker pads. The nose should be large and wide, with slightly puffed nose leather. The curve of the forehead should flow into the bridge of the nose with no break. The bridge of the nose should be above the eyes, and then the line should extend to the nose tip, making a very slight, to nearly straight concave curve. The neck should be long, substantial, muscular, and in proportion to the head and body. The torso should be long and substantial, medium to large, but not as large as the largest domestic breeds. The legs should be medium length, slightly longer at the back than the front. The feet should be large and round with prominent knuckles. The tail should be medium length, thick, and taper to a rounded tip. The boning should be sturdy and firm, never delicate, and the cat should be very muscular, especially in the males. The coat should be short to medium, dense and luxurious, close-lying, and soft and silky to the touch. The patterns allowed are spotted and marbled. Spots should be random or aligned horizontally. Rosettes should show two distinct colours or shades. Paw print shaped, arrowheads, doughnut or half doughnut is preferred to single spotting but not essential. Marbles should have a horizontal flow to their pattern. The contrast between the spots and the background colour must be extreme, giving a distinct pattern with clearly defined, sharp edges. Strong, bold chin strap and mascara markings are desirable. Virtually white undersides and belly are desirable. Blotchy horizontal shoulder streaks, spotted legs and spotted or rosetted tail are desirable. Belly must be spotted (allowance for blue-eyed snows) for all Bengals under GCCF rules. 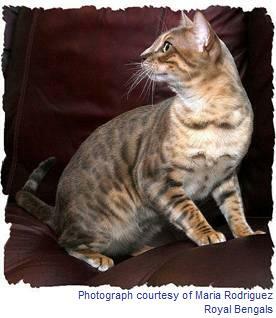 But TICA allow a marbled belly on the marbled bengals. Browns - all variations of brown are allowed, however a high degree of rufousing is preferred. Light spectacles encircling the eyes, and a virtually white ground colour on the whisker pads, chin, chest, belly and inner legs is desirable. Snows - pattern can be various shades of brown. There should be very little or no difference between the colour of the body markings and the point colour. Smaller size, in balanced proportion, of females. Slightly longer coat in kittens. Jowls in adult males. Eyes slightly almond shaped. Mousy undercoat. 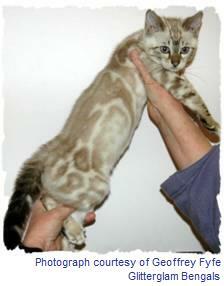 Spots on body running together vertically to form tabby pattern on spotted cats. Circular bulls-eye pattern on marbled cats. Substantially darker point colour in snows. Any distinct locket on the cat (a locket is a group of white hairs). Belly not spotted. Paw pads not consistent with the colour of the cat, or not all the same colour. Temperament must be unchallenging - any sign of definite challenge shall disqualify. The cat may exhibit fear, seek to flee, or complain aloud, but may not threaten to harm. A cat that bites, a cat showing evidence of intent to deceive, adult whole male cats not having two descended testicles, cats with all or part of the tail missing, cats with other than five toes on each front foot and four toes on each back foot, visible or invisible tail faults, crossed eyes, total blindness, markedly smaller size not in keeping with the breed, depression of the sternum or unusually small diameter of the rib cage.